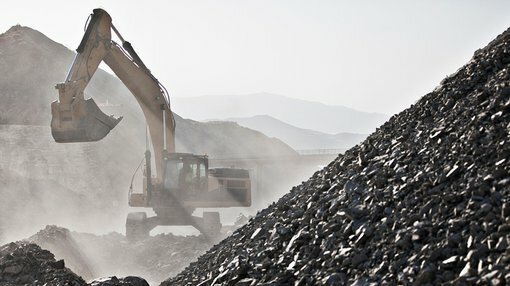 Finfeed featured Finders Resources (ASX: FND) earlier this week after discussing the company’s Wetar Copper Project with Managing Director, Barry Cahill. Since then the copper price has increased circa 5%, hitting a two-year high of US$2.82 per pound on Tuesday night. It should be noted here that commodity prices do fluctuate and caution should be applied to any investment decision here and not be based on spot prices alone. 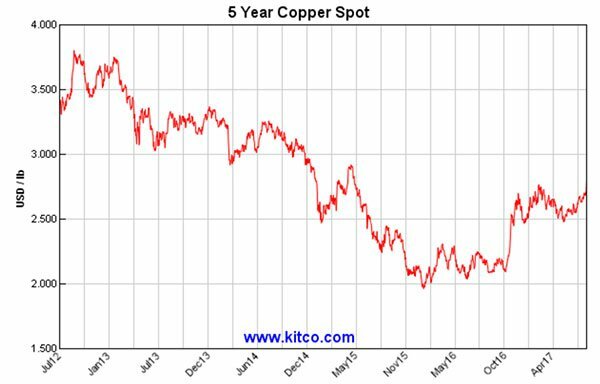 Seek professional financial advice before choosing to invest in copper stocks. The consensus seems to be that the commodity is being propelled to these prices by data from the world’s largest copper consumer, China. FND’s shares have responded accordingly, up from 17.5 cents less than a week ago to open at 19 cents this morning, representing an increase of circa 6%. This hike sees the company trading in line with its 12-month high. Elsewhere, Australian copper gold producer, Sandfire Resources (ASX: SFR) was up 7% in morning trading. We saw a spike of 9% in morning trading for Oz Minerals (ASX: OZL), which owns and operates the Prominent Hill copper-gold mine in South Australia that first came on stream in 2009 and now produces over 100,000 tonnes of copper per annum. Of course share trading patterns should not be used as the basis for an investment as they may or may not be replicated. Those considering these stocks should seek independent financial advice. Another company which is in the exploration stage that also may be worth watching is Alderan Resources (ASX: AL8). While the recently listed company is only in the exploration stages, it is targeting highly prospective areas in Utah, USA. Its recent IPO was particularly well supported – priced at 20 cents per share, AL8 shot the lights out, hitting a high of 77 cents within six weeks of listing. Harking back to FND, even prior to the surge in the copper price, analysts were of the view that the company was substantially undervalued with Canaccord Genuity analyst, Larry Hill, setting a price target of 35 cents. When speaking with Cahill he pointed to the prospect of capital management initiatives, as free cash flow increased and debt is retired in 2018. Hill is forecasting a dividend of 3 cents per share in fiscal 2018, implying a generous yield relative to the company’s current trading range. However, broker projections and price targets are only estimates and may not be met. As can be seen in the following table, FND’s earnings could increase exponentially should the copper price continue to run. The following sensitivity analysis indicates the significant difference comparing just a US$2.50 price with a US$2.70 price. In 2018, FND benefits from a significant uptick in annual production as well as sustained low operating costs, factors that should see the company generate operating cash flow of approximately $75 million. This will be used to place the company in an attractive debt-free position, as well as funding an active exploration program targeting sites adjacent to the Wetar project. 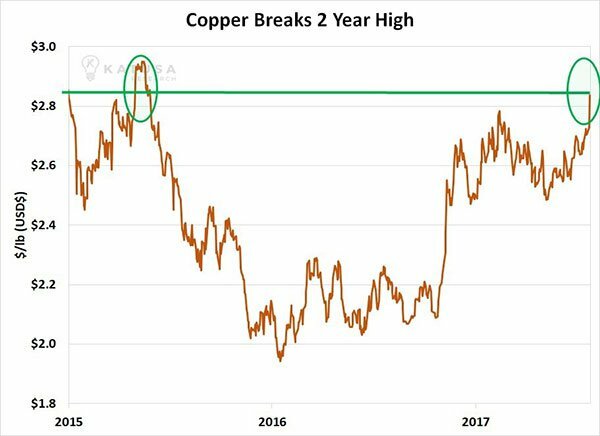 This five-year chart could provide some insight for those who are interested in looking at what may lie ahead should the copper price move above its current level.